I got ghoul's fair howleen, elsabat, and heath. All for $7.17 a piece. Got freak du chic Rochelle and her play set, got it on clearance at Target. I just deboxed her and OMG, deer feets! The Firece Rockers 3-pack from TRU's website. Deuce Gorgon vinyl figure. I love his vinyl figure... He is just so cool with his shades! Astranova finally went for a reasonable price (thanks joey for the tip)! But I ran into a problem...they had her both shades, and I loved both, so here they are! I noticed something though... it's not just her shade of purple that's different. The box around her is different, too. Her background (does she get darker the closer she gets to earth? ), and where the DVD ad is placed... hmmm, curiouser and curiouser, as I still don't know which one is the "variant"! Found New Scaremester Catrine and Clawdeen at Ross the other day. They're not on my wants list, but I've been looking for Catrine for my customs pile, so I couldn't really pass up a $9.99 doll. I don't particularly like NS Clawdeen, but I really wanted her leather jacket. I might see about doing something with her though, idk. I also got myself a Sir Hoots vinyl to go in my Ghoulia collection! I went back to Walmart for Posea but they only two they had suffered from varying degrees of eye wonk :/ So instead I just got Vinyl Count Fabulous since he was only $5. Scarnival Clawd. They had 2 at the Walmart I found him, so I picked the one with the best eyes, but slightly wonky facial hair. Those long, extra sculpted mutton chops can be tricky to style in real life too. I got Ghoul Sports Clawdeen for $2.99 at the thrift store! She has her outfit, hat, shoes, and bubblegum. Then we went to Walmart and I got Ghoul Fair Elissabat. I went doll hunting today and picked up the Fierce Rockers 3-pack at TRU, GSR Toralei at Big Lots, and Ghouls' Getaway Spectra at Walmart. Kjersti, Batsy and Isi, all mistakenly on clearance. Woo! 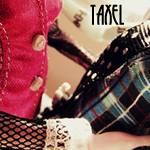 Got rid of some useless manga => money for dolls! Was too late (again) for original ghouls Lagoona, so i bought fitness Lagoona and ordered Lagoonafire. Found New Scaremester Catrine and Clawdeen at Ross the other day. They're not on my wants list, but I've been looking for Catrine for my customs pile, so I couldn't really pass up a $9.99 doll. Nice! Sounds like I need to make a trip to Ross soon! They always get the most random selection of MH dolls in at any given time. You almost have to check the store on a weekly basis around here so you don't miss a great MH find! I'm so jealous of you gals in Australia! Sounds like you all find the best sales!!! Just bought a Lorna last night. I finally found one with a level of wonk that was "acceptable." Maybe some day I'll have her repainted. 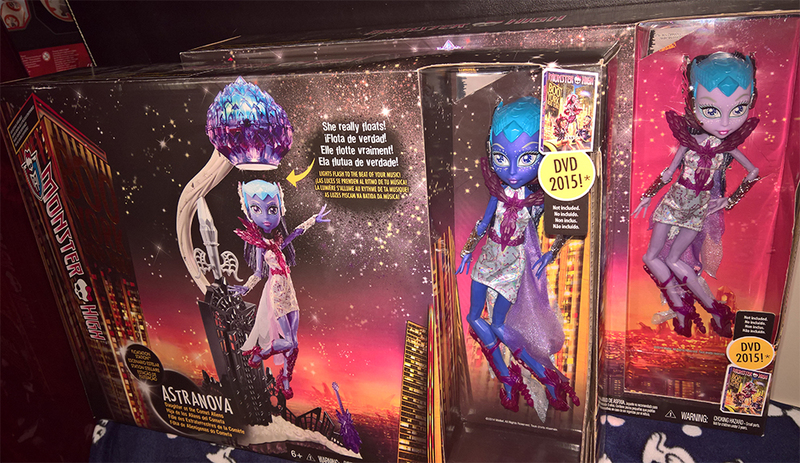 I picked up the lilac version of Astranova yesterday at Walmart. Her box price read $25 (clearance) but at the checkout she rang up at $21. So I now have her in both lilac and deep purple/blue. i got New Scaremester Jinafire at Toys R Us for 2 cents.